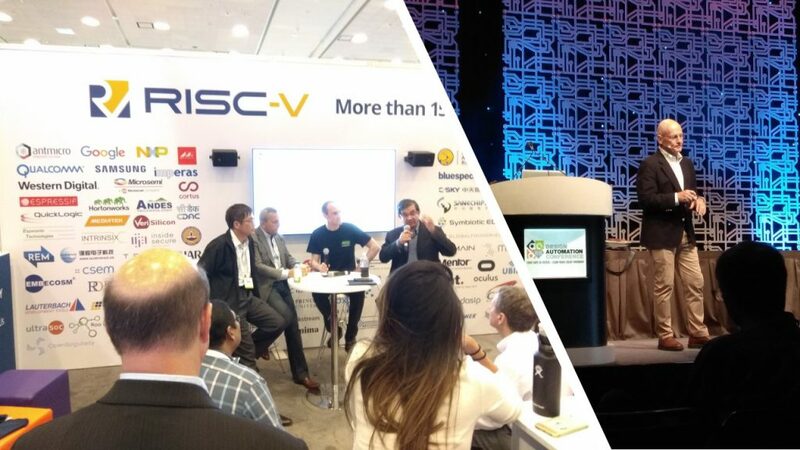 That’s exactly what happened in DAC2018 at Moscone Center, San Francisco. I was invited for a talk in DAC summer school, on my work “vsdflow” which is also one of the main topics of discussion in my “TCL programming” course on Udemy. I would say, the entire DAC was a journey of events, exchange of ideas between brightest minds of the world. Onur Mutlu, Professor of Computer Science at ETH Zurich, talked about development of in-memory processing designs, being adopted in real computing platforms and data-intensive applications. This talk was followed by Kaushik Roy from Purdue University, who introduced stochastic learning, which reduces storage requirement, while maintaining accuracy. Then came Sani Nassif from Radyalis and, would say, one of the best talks I have heard so far on EDA. 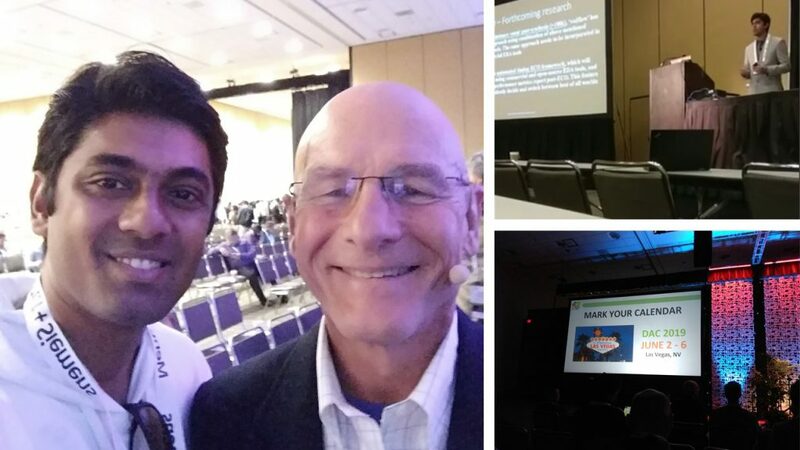 His journey from old calculators to iphone’s to machine learning to data mining was really an eye-opener. He has seen the world changing in front of his eyes and is amazed on how software replaced hardware, future of Moore’s law and EDA tools. Uniqueness of DAC is it’s a premier event, not only for EDA, but for all streams, right from embedded systems to MOSFETS to advanced machine learning and cloud computing. 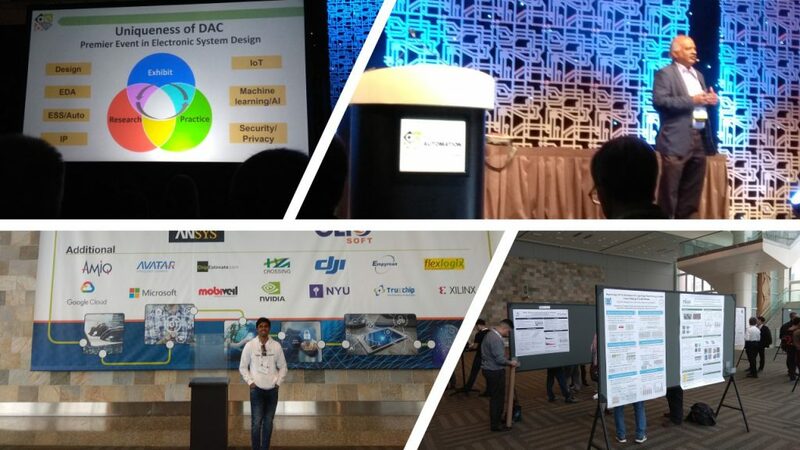 The posters which were presented were high-quality covering topics from electro-thermal simulations for analog designs, 3D IC’s, power-efficient clock tree design, multi-cycle path exceptions automation and verification methodology. 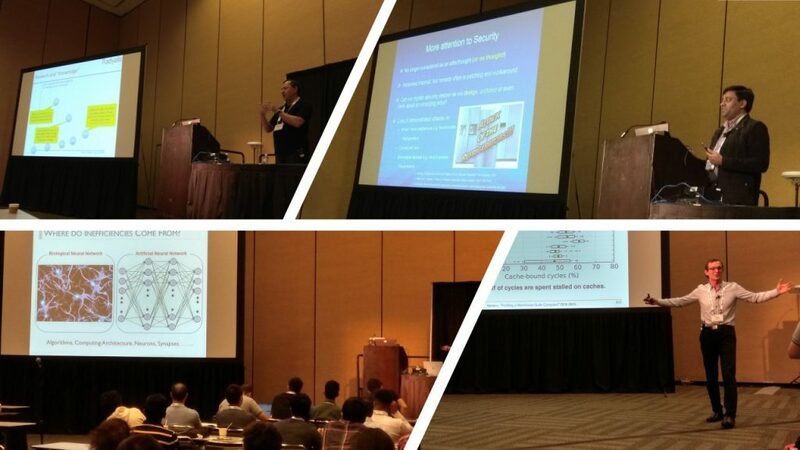 Not only that, there was a “Straight Talk” by Naveed Sherwani, SiFive CEO who discussed what’s changing in chip architectures, where open-source hardware fits in, who is using it and why he’s using it, and advantages and disadvantages of an architecture, which can be modified by vendors. This talk really inspired us, as most of our courses and vision are in-line with his talk about the future. When someone tells you, that you “are and were” doing the right till now, that’s inspiring. I also had a chance to click pictures with Prof. David Patterson, after months of following and working with him online, on RISC-V courses on Udemy. To sum up, this event has really re-shaped the paths to reach our company’s vision and very soon, you will see some exciting updates from us which will help you in a better way.